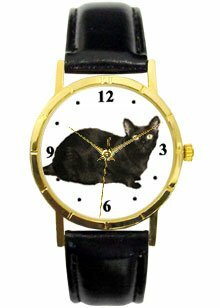 You are here: Home Cat Watches Black Cat watch classic size of 1.1/4 inch diameter Has gold tone case with black leather band. Battery operated. Black Cat watch classic size of 1.1/4 inch diameter Has gold tone case with black leather band. Battery operated. Black Cat watch classic size of 1.1/4inch diameter. Gold tone cae with a black leather band. 5 year warranrt battery operated quartz.